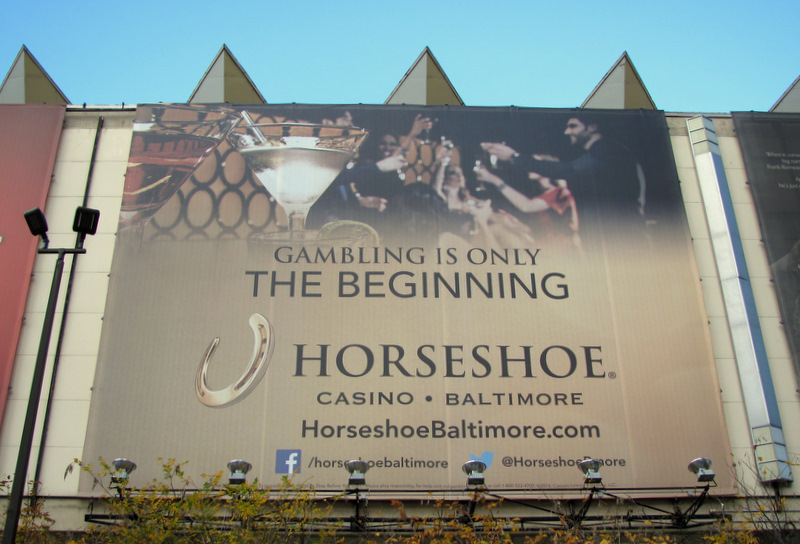 Above: With lower-than-expected revenues in its first full month of operation, Horseshoe is stepping up its advertising. This display hangs from the Baltimore Arena downtown. Baltimore’s Finance Department has lowered its estimate of community impact revenues generated by the Horseshoe Casino, throwing a monkey wrench into plans to expand sanitation services, plant trees and establish a summer youth program for the neighborhoods near the facility. Finance’s low-end estimate of $6.88 million in community impact revenues for fiscal 2015 is a nearly one-third drop from the $10 million predicted when City Hall prepared its spending plan last year – and far less than the $15.5 million the city projected when it approved the casino facility in 2012. Partly due to these earlier projections, the Rawlings-Blake administration has already committed $9 million of future community impact funds to reimburse Caesars Entertainment, the operator of the casino. The impact funds will go for already-completed road improvements at Russell, Bayard and Warner streets and a new underground steam line that Caesars paid for in order to open the facility on time in August. The money that the city owes Caesars will be drawn from impact revenues expected over the next three years, making the pot of money available for community grants that much less. The city’s revised revenue estimate – disclosed last night at the Casino Local Development Council (LDC) meeting – is below the calculations made by The Brew based on the first full month of gaming revenues from the Horseshoe Casino. The Brew estimated that the casino would generate around $7.5 million between its opening on August 26 and the end of the fiscal year on June 30, 2015. State Sen. William C. (Bill) Ferguson IV, who chairs the LDC, downplayed the projected shortfall last night. Noting that $3 million in “tier 2” community projects may not be funded in fiscal 2015, Ferguson said they could possibly be made “tier 1” items in fiscal 2016. Such funds would pay for about 100 tree plantings in South Baltimore, a summer youth job program, a neighborhood food advocate, a training program for construction jobs and small grants to community groups. The LDC could recommend that the mayor give “priority consideration” for these items in the 2016 budget, Ferguson told the council, which is composed of community and business representatives as well as Councilmen Eric T. Costello and Edward Reisinger. Amy Mutch, former president of the South Baltimore Neighborhood Association who sits on the LDC, objected to the city’s use of the words “community impact funds” to describe the expenditures. “I have a real problem calling this community impact when [so much of] it is totally going to the casino and its operations,” Mutch said, citing $3,375,000 of funds allocated this year for added police, special sanitation services, traffic enforcement and increased medic services for Horseshoe and its immediate surroundings. She asked Ferguson if she was supposed to go back to her community and say the spending plan was developed by the council when it was actually mandated by the mayor’s office. Ferguson said the council did set spending priorities when the LDC was established last year. However, the LDC’s yearly spending is handled by city agencies. with the council given a 45-day review period to comment on the proposed budget. The spending plan slightly decreases the cost of city services provided to the casino (police, fire, sanitation, traffic enforcement) largely because installation of CitWatch cameras, costing $1,024,000, has been completed around the casino’s perimeter. On the other hand, the city is obliged to pay Caesars $3.5 million from the 2016 budget – $2 million for the road improvements and $1.5 million for the redirected steam line. In the citizen comment period, Bill Marker, a resident of Barre Circle, asked LDC members to determine for themselves whether spending impact funds on the casino is legal under state legislation. James Alston, a LDC representative from Westport, said he agreed with Marker’s assessment. “This is why I have been, quite often, a voice of dissent” regarding the use of impact funds for the casino, he said. As the other council members remained silent, Ferguson said the comment period was over and called the meeting to a close.